Discover the insights, tools, and workshopping you need to be a confident, enthusiastic, efficient, and effective executive leader. Next event in Denver, June 8 – 9, 2018. 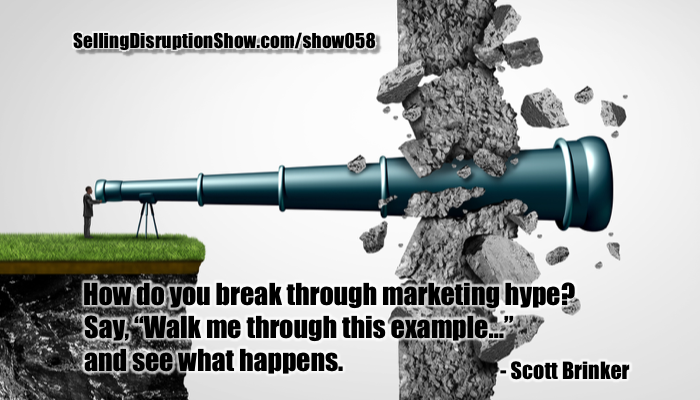 Mark S A Smith: My guest today is Scott Brinker, and Scott has had a major impact on my life over the past year or so, when I ran across his Martec’s Law, which we’ll explain in just a minute, changing radically how I start presentations and conversations. And it really frames up why you have to embrace disruption if you’re going to survive in today’s world. He is the Vice President of Platform Ecosystems at HubSpot, a company I’m sure you’ve heard of. He is the Editor in Chief, Martec.com, talking about marketing technology, we’ll dig into that, and he’s a program chair of Martec, a conference that helps people do better at marketing technology. Welcome, Scott. Scott Brinker: Wow. Thank you, Mark. Delighted to be here. Mark S A Smith: Let’s talk about Martec’s Law, since that’s the key reason why we connected initially. Martec’s Law is that technology changes exponentially, really fast. Yet, organizations change logarithmically, very slowly. And this gap widens over time, eventually requiring a reset of the organization. So, because of this management must strategically choose, which technological changes to embrace, given the highly constrained bandwidth for absorbing organizational changes. That is a massive insight. How’d you come up with that? Where’d that come from? Scott Brinker: Wow. Well, being a technologist at heart, by background, working in the marketing world, of course, we know technology changes exponentially, right? The example that’s easiest to look at is Moore’s Law. Computing doubling every two years or so. And we see it, not just in computing power, but storage and all sorts of dynamics of adoption of how mobile adopted, Facebook Messenger, and the list goes on. So, we definitely see technology does these exponential curves. But, as I was increasingly working with more and more chief marketing officers, and executives at companies that were trying to understand, okay, how do we adapt to take advantage of this new technology? It was fascinating to me, they kept realizing that the challenges they were running into weren’t technical. They were organizational. They were like how do we change behavior, and thinking, and culture, and structure? And we know, this stuff is hard to change, it’s slow. Just sort of doodling one day, and putting that exponential technology curve juxtaposed, again, sorry. How do we humans actually change to percent per year, year over year? Yeah, at best. And then you see that gap between the two of them and you’re like, “Aha, okay, this is why everyone is struggling with this today. Mark S A Smith: Right on. And what I added to this conversation based on my own experience is that organizational change caps out at the cognitive capacity of the top officer. So if you have somebody who is really bright, and can adapt to change rapidly, everybody will follow that leadership fast. And if you have somebody who’s a dinosaur, they die. Scott Brinker: Yeah. So when I look at this graph, the exponential for technology, just leave that alone. The question becomes, for the rate of change for a company, no company’s gonna be exponential but there’s still a lot of variants. Some companies change very slowly but others … I think you’re absolutely right. Depending on the leadership, depending on the culture, depending on things like agile management practices and stuff like this, they can actually accelerate their rate of change and while that doesn’t let them change with everything in the technology world at that pace, it gives them an edge over their competition and that’s really what matters. Mark S A Smith: As Mark Benihof of Sales Force points out, we no longer compete with each other, we compete with speed. And that’s what it is. How fast can we adopt change? How fast can we bring new change into an organization? Now, this impacts every business and I have two incontrovertible sources to prove this. Number one is the fact that the Fortune 500 turns over by 50 percent every decade. Half the companies in the Fortune 500 weren’t there ten years ago. And half won’t be on the list ten years from now. That’s the first one. Big companies are not immune from this. The second one is, of the original DOW Jones industrial average list, there is only one company left on that list. GE. And they’re about to be de-listed. Scott Brinker: I can’t. Sad but true. Mark S A Smith: Absolutely. It’s absolutely true. Listener, if you’re listening to this and denying the fact that you can’t keep up, I’ve got one question for you. What percentage of the people in your company still run Windows 7? I rest my case. Scott, how can people accelerate? What can managers do? What can owners do? 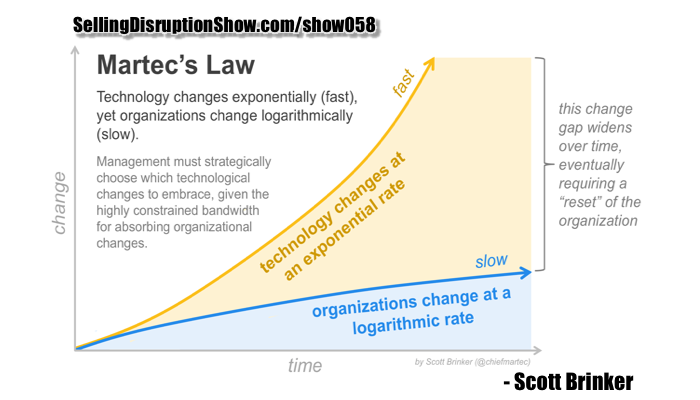 What can executives do to keep Martec’s law from disrupting their organization? Scott Brinker: Yeah. That’s really what it comes down to and as far as I can tell, there’s no silver bullet. But there are basically, three strategies I’ve seen companies take. Mark S A Smith: So take that opportunity. Don’t squander that opportunity to take radical change in the organization. Good. I like it. Scott Brinker: Alright, so that’s number one. Number two is to generally increase you’re operating management metabolism. To me this all comes down to agile and lean methodologies that have become very popular, certainly across the software world but also increasingly ain marketing and frankly many other departments because agile and lean methodologies are really all about making teams more adaptive to change, the ability to sense change faster and the ability to act and react on those changes faster. So that’s the second strategy we see. Mark S A Smith: No that is … It’s purely cultural. It has to be a culture that’s driven from the top through the entire organization. Scott Brinker: Absolutely. But it’s one of these things where in today’s world, if you’re not making that sort of cultural shift, to becoming truly agile, you’ve got a serious risk that you’re incurring because your competitors almost certainly are. Scott Brinker: And then the third strategy, in some ways is both the simplest but also the hardest and it is, you can’t embrace all of the change that’s happening in the world of technology all at once. There’s only a finite amount of bandwidth you have inside of your organization, inside people’s heads to be able to adopt a set of changes and so you have to be just super intentional and strategic about deciding which changes are most relevant and important to our business, to our customers, and let’s focus on those. Make them clear priorities and not get distracted by the five billion other changes that are all happening in parallel. Let’s be really smart about picking what our priorities of change are. Mark S A Smith: That reflects a conversation I had with Jerry Purcell of Prince and ICG, internal Consulting Group. And he says, “The issue of market is not about innovation, it’s about executing on what we already know.” And that’s absolutely in alignment with your third concept here. We can’t embrace it all, let’s just be intentional and strategic about what we’re going to do and get it done. Scott Brinker: It’s easy to say. It’s really hard to do because when there are so many changes and every day, you go to your website, you’re getting new news stories of, “Oh, hey, wow. There’s this cool thing happening in virtual reality or there’s a whole new social network or artificial intelligence is now doing this other thing.” There is no lack of potential distractions to really be able to have clarity about which ones you’re prioritizing and stay the course on them long enough to make them effective. That takes a certain stamina. Mark S A Smith: That’s leadership. You just defined leadership, right there. That’s what it takes. I think it also depends on the cognitive capacity of your team overall. And what I have found is the higher the cognitive capacity, the easier people can take on change ‘cause they can handle the complexity of the change. Lower the cognitive capacity, the less change that they can handle. And unfortunately, as we age, we tend to not be able to handle complexity quite as well. The number of choices we can make tend to decline. And so one has to wonder, as leadership of organizations change, what appears to be prudence, is actually just fatigue. Mark S A Smith: They just can’t make the changes like they used to and so this begs the idea that the top management needs to change on a routine basis just to keep up with change. Scott Brinker: Yeah. I think this is one of the things that when we look at making organizations more agile, part of what we’re trying to accomplish there is making them a little less hierarchical. The change doesn’t have to always come from the top down. I think top down, you have to set the culture, you have to sit down and create this framework that enables change but one of the most powerful things about these agile methodologies is saying, “There’s actually lower organization, the people who are really on the front lines of this stuff, that are in the best position to sense what is changing and actually take action. To experiment and iterate and see, ‘Okay, how do we adapt to this new sort of thing. '” I think if you give people the permission to do that, then you create that kind of environment inside your organization. You don’t have to have the person on top being at the absolute leading edge of what the change is. They’re the champion to making sure that the organization overall is committed to the leading edge where it’s change needs to be. Mark S A Smith: So the leader has to create the container that will permit change to occur and then the organization has to be able to embrace change at multiple levels. Being strategic about what you choose and specific about the outcome. And that seems really countered to the way most companies are organized today. Scott Brinker: We were organized for a world that wasn’t changing at an exponential rate. Mark S A Smith: That is so true. Scott Brinker: This is why Martec’s Law is difficult. If you’re listening to this and you’re thinking, “Wow, we’re having a really tough time with this.” I don’t know of any company I’ve met that isn’t having a tough time with it. It is just an incredibly challenging balance between those forces of good pace of technological change and keeping up with organizational change. Mark S A Smith: The new generation, the millennials and Gen Z, are very adept to change. They seem that way to me. I’ve raised five millennial children, I consider myself to be a success because none of them live at home. Mark S A Smith: Thank you. And they really are good at embracing change. And Gen Z, even more so, because listener, do you have a young child in your life? Say five or less. Do they play Minecraft? Well if that’s the case then they understand how to generate online worlds and conduct commerce before they can spell their name. The world’s a very different place and so the good news is that, the forthcoming generations probably can keep up with Martec’s Law a little bit better than say the Boomers or Gen X. Mark S A Smith: And if that’s the case, welcome to our world. It’s just such an important component, that for us to admit to ourselves that we have blind spots when it comes to technological advance and adoption. And we need to recruit help. And we also have to create a culture that permits us to do that. I believe that I am currently a millennial in a Boomer body. I’d look for every possible way that I can incorporate technology and change and I seek out help for that. I really do need that help. Scott Brinker: Well I think that mentality of just a curiosity and an interest in learning, that is possibly the most powerful characteristic that really anyone in the workforce can have today. Cause the moment you shut down that curiosity or the interest or the willingness to even try and learn something, just things fly by. You blink and the world as you know it has changed. Anything we can do to encourage that greater sense of curiosity and wonder, regardless of someone’s generation, I’m optimistic that we can move a lot of people there. Mark S A Smith: I’m optimistic about the future as well. There’s no doubt about that. For me, we have to keep feeding the crystal ball. That’s why I go to CES in January, here in Vegas. I’ve gotta go out there and know what’s coming down the road. And I’ve gotta read articles and blogs and things I don’t normally sample. What tools do you use to feed your crystal ball, Scott? Scott Brinker: I am a veracious reader and luckily the world of content is another one of those things that’s grown exponentially. So there’s far more content on any given day than I will ever get to read. But even just cherry picking, it’s fascinating. You dive into so many of these topics that are right on that edge of reality and hype. Fun stuff happening with block chain, fun stuff happening with virtual reality, augmented reality. What is the state with artificial intelligence. There’s a lot of hype in these things still and so you definitely have to approach it with that right mix of curiosity that you’re willing to engage this and learn it and try and understand it. But also a healthy dose of skepticism for where the reality of that particular technology is today. Mark S A Smith: Well I think the five that you mentioned are hard trends, inevitable, will be well entrenched in our life in the next decade or two. The question becomes which flavor, which version are we going to adopt. And I think a big piece of this is just understanding that all five of those are gonna disrupt companies. How can you keep up to date with what’s going on? How can you separate the hype from what’s real today? How can we create a timeline, a road map, a destination plan for us to get there? For example, in my business, I don’t see AI as being a part of my business for another four or five years. I can certainly see it being a part of my business beyond that but we’re just not there as far as the engines and the incorporation and the ability to roll this out in a way that makes economic sense to me. Now, on other business, AI has to be everywhere. So do you have some tips on how people can figure out how to separate the hype from the reality? How to take these hard trends and turn them into a plan to stay ahead of the game. Is there something else that you have in mind beyond the three strategies that you gave to us? Scott Brinker: Certainly in the world that I come from marketing technology and speaking to a lot of marketing technology vendors, there’s always two discussions. There’s the canned demo discussion. And you gotta beware of the canned demo discussion. Not because people necessary intentionally try to overstate the case but when someone gets to script their own narrative, inevitably those of us in the marketing world, I’m as guilty of this as any of anyone. It’s just all to easy to have the script make all the right choices at all the right points to put on the best possibly like of what something could be. Which is great. That’s fine as an opening discussion. Scott Brinker: And as a prospective buyer, it’s your job to be a little bit skeptical to be able to say, “Okay, that’s great, that’s cool. Walk me through this example.” And this is why I always recommend to buyers of marketing technology when they’re evaluating a vendor, is have some very concrete examples of a problem you’re trying to solve in your business that you can actually present enough of that information to the vendor and have them show you specifically, “Okay, here’s how we would go about addressing that with our technology.” Get out of the canned demo and get into, let’s bring this down to the ground of, if we were gonna implement this in our business, what would it look like even for one or two really concrete opportunities. People would be shocked. What? Aren’t you gonna give me a pitch? No. I mean, I could show you my favorite feature, but I don’t know if you’d like my favorite features. Scott Brinker: You’re absolutely right. And I’m just nodding my head because one of the things I do in Martec is, over the years, curated every year, an infographic of all the marketing technology vendors I can find. And it started with 150 vendors I found in 2011 and last year in 2017, the infographic landscape had over 5,000. Mark S A Smith: Yeah, you need a billboard to be even to read it. Scott Brinker: Oh my god, I know. It’s crazy. But believe it or not, I actually go to the website of every single company on that graph. Because I’m trying to understand, what are you selling? How do I map this into a category? And one of the things that has shocked me year after year, I mean these are people selling marketing technology. Marketers in marketing technology. And I hate to say it but half of them have no idea how to tell their story. How to give that narrative and explain, not with the buzz words, but concrete, what problems am I solving? How do I solve them? Which is why, whenever I find a vendor that does that and does it well, I’m like, “Aw yeah, these people rock.” I should start a fund just to invest in people based on if I can understand your website in 60 seconds or less, I’ll invest in you. Mark S A Smith: That’s great. Just guess, what percentage of the sites that you’ve reviewed actually have a clear marketing message? It’s less than half and I would say maybe 30 to 40 percent, you can say, “Okay, I get your marketing message.” But then it’s a much, much smaller percentage, maybe like 15 percent where it’s not just a clarity, it is a compelling proposition. It’s like, “This isn’t just what I’m selling. This isn’t just the problem I’m solving. But here’s an insight I’m gonna give you about how we approach this that is really exciting.” And you’re like, “Oh my goodness, I hadn’t thought about it that way. That’s a brilliant way to look at this.” Even if I don’t buy your product, actually looking at the world through the lens you’ve just given me is valuable to me. Thank you. I love vendors who are able to master that craft. Scott Brinker: What would you say is the essence of that compelling message, that 15 percent? Other than, they just got you excited. I mean, that’s one. Hey, new view of the world, that’s really cool. I like that. The world makes more sense to me because of me reading your compelling value prop. That’s a great one. I like it. What others have you seen that trigger that response in you? Mark S A Smith: It’s an interesting combination of changing your world view but also making it really concrete. If it’s all at the 50,000 foot level, just not enough there or there to wrap your head around it. If you just dive into the concrete and you haven’t created some sort of over arching storyline, that puts those concrete details into the context of something meaningful, something exciting, then it just quickly evolves down into the age old, featureless. Scott Brinker: Yeah, in which case, customers have to figure out what features map to what they need to accomplish and a customer confused, cannot choose. Scott Brinker: The old fab selling features advantages and benefits. Selling works really well for simple, low consideration products and services. But do not use them in high consideration situations. Most of what we’re selling today is high consideration. Mark S A Smith: Well and you have to put yourself in the shoes of the buyer that is faced with Martec’s Law. They’re faced an environment where they’re being assaulted with new changes and new technology on every front. And at the same time, they know their organizational ability to adopt change is incredibly constrained. And so if you’re able to both simultaneously break through the noise of all the other exponential change that these folks are wrestling with, but connect that story to how are they actually gonna bring this to life in their organization and to have some sort of empathy for that organizational change challenge. That’s one of the things that makes those 15 percent who do a really special job of this, so good. Scott Brinker: So you just introduced me to another angle of Martec’s Law, which is not just observing how the world works, but also applying it to the people that we’re messaging to and helping them figure out how to bridge that gap between the technology I’m offering and the organization they have right now. So perhaps, part of our job as a marketeer and product innovator is to make sure that the gap between our offering and what they can accept isn’t so big they can’t make the leap. Mark S A Smith: Yep. Or that there’s some sort of way to be able to either say, “Here’s how you get this change under the curve of what you’re able to absorb.” Or possibly, “Here’s an inflection point that you may be coming up to that would be the ideal opportunity.” That’s one of those inflection points, where for you to make a qualitative change which our solution could deliver a really big impact to you. You look for this way of matching your beautiful prop to the organizational change opportunities that they have. Scott Brinker: That’s a really important point. Listener, I want you to nail that one down. In marketing, you have to figure out the inflection point in your customer where it makes sense for them to make the change that you’re offering in your organization. That is a killer concept. That’s a multi-million dollar idea that you can take and run with, because it means you don’t message about the product, you message about the transformation. That’s really good. Really good. Yeah, a little stunned silence here. Mark S A Smith: Yeah, okay. We’re taking that one in. I’ll take it. 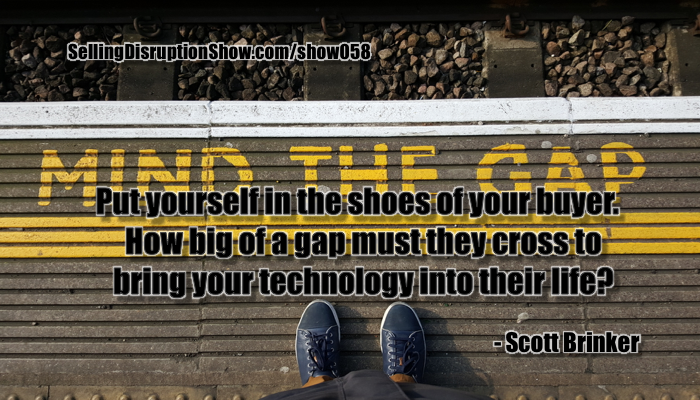 Of course, that’s what we’re looking for, here in the Selling Disruption Show, is those really brilliant insights that can disrupt. Boom. Scott Brinker: Wow, Alright. I Like It. 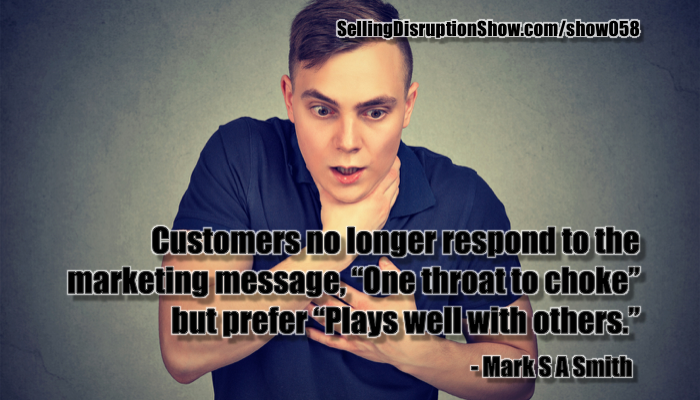 Mark S A Smith: Let’s change gears a little bit and in the last ten minutes or so that we have together, let’s talk about the five disruptions of marketing that you just recently updated on chief Martec.com and of course, that’ll be on the show page, that people can get to. Some of the things that you see going on right now and I know this is a five part series. Mark S A Smith: And each one have five points within the five points which is 25 points. Alright. Scott Brinker: Alright. So the five changes. The first is this idea that when we talk about digital transformation, my view of it, is it means we’re no longer looking at these isolated departments, like, “Oh, there’s marketing doing digital stuff and there’s sales doing digital stuff and customer service doing digital stuff.” But really the essence of digital transformation is starting to look how the organization as a whole is now connected through some sort of digital capabilities. Partly so you can give greater continuity in the experience you’re delivering to your customers. And partly so that the way you start to operate internally has less to do with those organizational boundaries and more with actual opportunity and process flow, customer service flow, things of that kind. Mark S A Smith: It’s a uniform experience no matter where they start working with you. Whether it’s a product, marketing, sales, customer support, it has to be a unified experience and it has to be digital. Scott Brinker: Number two is this recognition that software has changed forever. This idea that we used to have the software application or one or two big pieces of software applications at our company. That’s no longer the case. Thanks to everything moving up into the cloud and this is explosion of innovation of all these small software as service providers is almost every company is using a whole collection. They have this whole stack of marketing and sales tools that they’re using. The real transformative disruption here is to recognize that’s actually not a bad thing. There’s a lot of advantages you can get to having this stack but to take advantage of it, you have to really be able to own it. You have to be able to say, “Okay, this isn’t just a random collection of tools.” But we are thinking now actually, much more carefully about, how do we actually orchestrate the different tools with the right tool for the right job but we have some sort of fabric. Whether it’s through a core platform or systems of record or there’s these things called innovation platforms that are service tools like Zapier need to be able to use these so that on one hand I get the benefit of this incredibly array of innovation. But at the same time, I’m also providing some sort of coherence and orchestration and organization to those set of tools. Mark S A Smith: That’s it. You and I are absolutely on the same page. It’s the only way we can make money going forward. Scott Brinker: Alright. 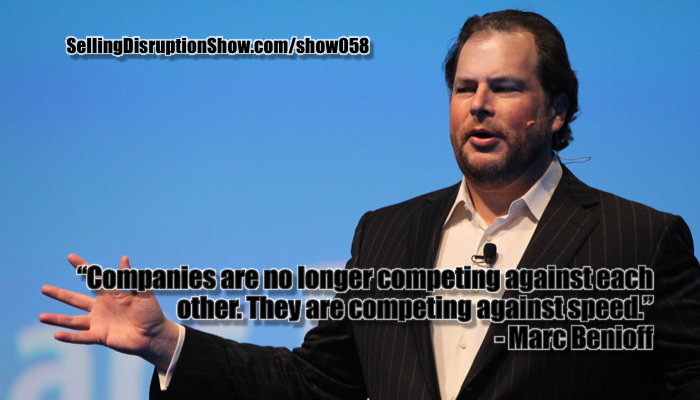 So the third disruption is about a very different kind of competition that companies are facing. Most competition that we’re used to thinking of is called horizontal competition. So it means, for instance, if I’m at a hub spot, so we sell this platform for marketing automation and CRM, our horizontal competitors are companies like Sales Floors or Mail Chimp or Marketa or folks like that. We’re used to thinking of those kinds of competitors but actually in the digital world, lives a very interesting kind of competition called vertical competition, which we can look at is, if you imagine the distance between the marketer and the consumer in the digital world, there’s actually a lot of intermediaries that go across there. So there’s the marketing software to manage those interactions but then very often, we’re also having to go through mediated services. Facebook and Google and LinkedIn and Twitter. They have their own set of rules, we call them wall gardens. They have a lot of control, lot of power. But then you even go further down and the particular software that consumers are using, like their choice of smartphone and the apps they have, have they installed an ad blocker on their browser? If they’re using a device like Alexa from Amazon, okay, this all of a sudden becomes this exclusive touch point, if you’re accessing those particular consumers, in that context. When we think about competition between Hub Spot and Sales Floor and Marketo, that’s one set of dynamics but what’s really intriguing to many is the competition between companies like Sales Force and Facebook and who’s running the ad blocker and does Amazon Alexa have access to a set of commerce transactions that Facebook doesn’t. You look across that vertical channel, so it’s interesting for two reasons. Scott Brinker: It’s a bit of mind bender but when you start to see it, your eyes definitely open up wide. Alright, so the fourth one, pretty short but incredibly powerful. It’s this idea of digital everything. That when we talked about digital, we used to mean the web. Alright, well there’s the web and the email. And then there’s web and then email and social. And then mobile. And now we’ve got voice devices and wearables and smart TVs and Internet of Things and VR and the list is exploding. Again, this goes back to exponential changes in technology. And so, we can no longer as senior marketers, just think about the individual touch points. We have to start to craft both our capabilities and our strategy around the idea that there’s practical purposes and an infinite number of new kinds of touch points that are gonna keep coming up and we need to have some sort of way of orchestrating it across all of them. Mark S A Smith: Right. And so you just have to think about how that works. Think about how today’s customer and tomorrow’s customer are going to be influenced and have that within your scope. Scott Brinker: And the fifth disruption is we can’t have a talk about disruption, without bringing this one up, artificial intelligence. Scott Brinker: And the thing that I really try to drive home to people when they’re thinking about artificial intelligence and how do they really prepare for this. How do they take advantage of it? In my opinion, it’s not really about the intelligence in the sense of the particular algorithms that you’re using for machine learning. There’s value to those things but the truth is, most machine learning algorithms are available open source. You can rent them in the cloud through Google, Amazon, Microsoft. So where’s the competitive advantage? The competitive advantage comes down to the data that you are feeding these algorithms. The most valuable thing you can do for your business to prepare for having the capabilities of artificial intelligence, is first of all to get really clear on what is going to be the unique data for our business. The data that we’re gonna have that our competitors aren’t. And the second thing is to, wow, make sure that data is good quality because quite frankly a lot of data when we were in this whole big data movement five years ago or so here, we collected a whole ton of data. But the quality of it, who knows. And I think that’s something that we really have to start to get a lot smarter about because these machine learning algorithms, they’re not magic. They’re math and they’re statistical algorithms. They will give you the results, based on the data you feed into them. So if you feed them poor date, you’re gonna get poor results out of it. Mark S A Smith: You’re gonna have a moron for an AI, that’s for sure. The last I heard, is it takes about 70,000 experiences for an AI algorithm to get really good. Scott Brinker: I can believe that. But here’s the thing, this is why this is so fascinating, this guy Allister Crawl, I was reading an article of his last year, and he was like, “Okay, the fact that this AI just beat a bunch of folks playing chess, that isn’t really surprising anymore. What’s surprising is the way the AI beat them, is the AI was able to simulate and play out something like 4 billion games in a period of 4 hours.” The scope of computing power here, it is that exponential change and it’s really hard for us to appreciate just how smart these algorithms, given the right data and given that computing power can be. Not because they’re really that smart, they’re just operating, they’re trying every single possibly variation to find their right, optimal spots. And they can do it at a rate that we were never able to do in the past. Mark S A Smith: It can handle a wide range of complexity and explore an enormous range of potential outcomes and that’s what’s going to drive AI’s ability to explore options that we have a hard time keeping up with. So one of the ways that organizations can keep up with Martec’s Law is through AI. Where the AI will assist us in making better choices by alerting us to information that we didn’t know what available before. Scott Brinker: Yes. I agree with that. Mark S A Smith: There’s a positive side and a negative side, fundamentally. If I can teach you how to do it in five minutes, AI will take that shot away from you. And on the other side, if you’re really good at being creative and looking in the future, it’s the psychology more than the technology that limits what can be adopted. Two reactions to that. My first reaction was, “Okay, well that’s great.” I kinda get that. Marketing is a lot of that’s power is creative and story telling and narrative. I get that. Mark S A Smith: That’s where this robot is lying to you but it’s interesting cause you took that to sales and the percentage is substantially higher. And the reason why is because sales is a job that’s taught. We teach sales training. Marketing’s a little more difficult. Marketing is more of an art because it’s a moving target. We have a lot of interesting challenges ahead and it’s really good to keep your mind wide open. Stay learning friends. Stay hungry. It’s the only way you’re gonna make it through. Scott, this has been a delightful conversation. I’m delighted to have you on the show, to have a conversation with you, to share with my audience the brilliance that you bring to the world of marketing. Thank you. And how should people get ahold of you. What should they do next? What would you like for them to do? Do you have a book you’d like for them to buy? Send them to chiefmartec.com? What would you like to have happen? Scott Brinker: Come to chiefmartec.com. It’s chiefmartec without the ‘h’ at the end. Long story there. Mark S A Smith: It was a good idea. I thought it was a good idea. 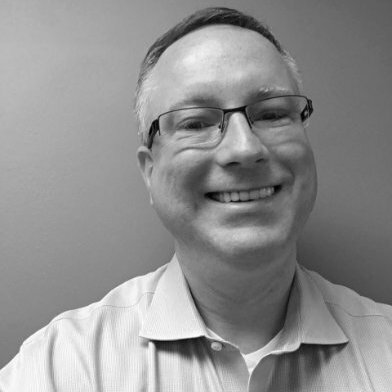 Scott Brinker: And then I’m also @chiefmartec on Twitter, so feel free to reach out, I’m happy to chat with you. Mark S A Smith: Great. Thanks Scott.